Fifteen years later, the system still exists and it has failed to operate for the purpose it was intended for. Instead it is a mechanism that promotes oppression and racism, go to the centres around the country, people are living in fear as some of the so called centre managers are dictators that keep harassing poor people who already vulnerable due to one thing or another. There are few factors to look into that lead to direct provision to be still in existence. The influx of immigrants that seek asylum from year 2000 increased in alarming numbers. This direct provision was then a tool that was seen as a mechanism that would address this increase and make it as hard as possible for those that were already in the system so that a word will go out there and discourage new applicants. Now take a look at year 2004 about five years later, the figures dropped to 4766, these were now the evident effects of direct provision. 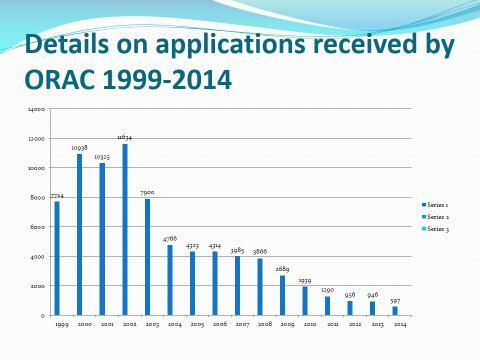 And this decline continued as a result only 946 applications were received for the whole year 2013. In 2013 RIA closed one centre and this, alongside an aggregate reduction in bed spaces in the remainder of the centres, led to an overall reduction in contracted bed spaces of 411 (7.5%). The cost of the Direct Provision system continues to fall. RIA spent €55.23 million in 2013, a reduction of 13% from the 62.3 million in 2012. The spend in 2013 represented a decline of 40% from the peak of €91.5 million spent in 2008. The Scandal report on Direct Provision by TV3 in 2014 managed to expose facts and figures the department spent per centre and what the owners gained in profits per year for the first time in years. Also the newspaper The Journal.ie covered an article on some figures the department spend in millions of Euros of which the minister spelt it out as money spent on asylum seekers without any break down. Mind you asylum seekers only see €19.10. Direct provision keeps destroying our children’s lives the longer they are kept locked up in these centres. As parents we are not in full control of the proper growth of our children as this right is taken away from us due to the constraints that we are living in. A mother cannot even prepare a simple lunch for her daughter or son and package it to the school bag, this joy is taken away from us. Instead someone from the centre takes over this wonderful duty and child and parents must queue in the morning to pick up the already pre-prepared lunch box. This makes the child to envy more the worker at the centre rather than the mother. Need I say more? A lot has been reported on this subject from the expects point of view. The bottom line is, no child is meant to be raised in direct provision and be treated like prisoners with restricted movement with no visiting or sleep over rights. Direct provision leads people to health issues such as depression, mental issues and little is being done to address current issued we are even facing now here in KRAC. Some of these health issues are as a result of the long term deportation orders that are hanging over us for so many years. Those on deportation orders must report at the Gardi station with their children on monthly basis. Children are forced to be taken away from schools just to go and sign with the parent and if the parent did not do this, she/he will be subject to immediate deportation. Deportation orders are even issued to those countries the government know they cannot deport to. How do you lead a normal life with a deportation order for five years and more, it’s insane. 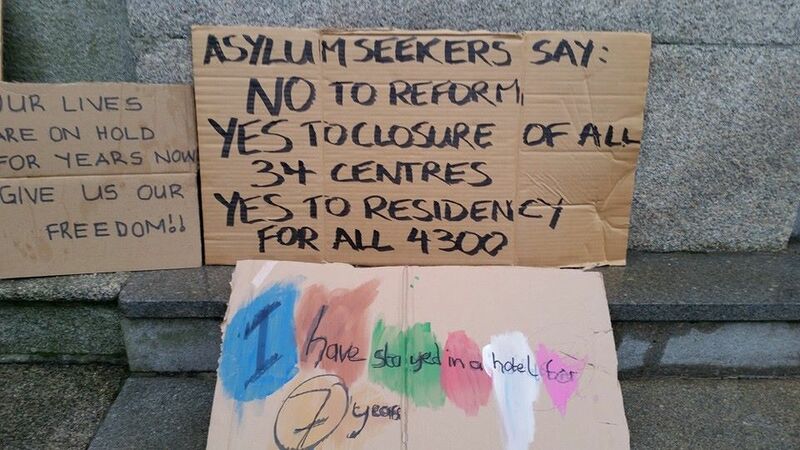 Direct provision exist as it is easy to pick up asylum seekers from the centres and deport in the middle of the night when no one is watching. Families have been separated throughout these years through deportations. Direct Provision is an inhumane system that degrades individuals and make us feel useless as we cannot directly provide for ourselves. We are not allowed to work as you all know. Last year the minister for Justice and Equality reacted with shock to a newspaper article that run a story about a lady that resorted to prostitution due to poverty and promised to do an investigation to that. Only she knows where that investigation went. The working group appointed by the minister to look into the ways to reform the direct provision to make it more humane in her view. It is our view that the reformed direct provision is no different to the same one that was created 16 years ago. That is why we are saying there is no way this direct provision can be reformed, the only option is to close it and allow us to work and integrate with society like normal human being while we wait for our applications.End direct provision. Mark my words, what has been happening in recent times with the daily killings of immigrants from Africa and other parts of the world is not an accident. Someone somewhere is responsible for all this and it cannot be going on for so long with little effort for the powers that be. We have seen some countries willing to help while the other choose to sit back and let people die. People are toying with people lives and we only see finger pointing that’s all. Get to root cause of this and sort it country to country start talking and help people and save lives, one life lost is one life too many. Finally one day this government or even the one to come in the future will see fit to make an apology to all asylum seekers for what they have put them through for so many years.